You know the important of buying (and using) quality pressure washing equipment to build your business. But, have you considered the role that understanding the equipment you are using as part of your pressure washing business plays in your overall success? If you are familiar with the parts and purposes of each part of the pressure unit, you will be more able to troubleshoot problems and maintain your gear in the best manner possible. This will pay off over time by making your pressure washing equipment last longer, run better and require less maintenance – not to mention the costs of up keeping damaged or worn parts. One of the most important parts of your pressure washer unit is the high pressure pump. Without it, the unit can not do the job you need it to do. Whether you specialize in offering your customers high or moderate pressure applications, Industrial Triplex Plunger pumps will likely play an important role in the work you do. In the high pressure washing equipment models, the pump is designed with a die-cast body and is finished with a brass head. Using thick solid ceramic plungers ensure long life and strength. The anodized cooling fins prevent overheating by dissipating heat created within the motor. Balancing the drive and non-drive sides are large needle bearings and balls that work with precision supports to keep alignment and centering in place with the crankcase. The internal components assure strength and disbursement of weight though the use of valve cages and ball bearings on the solid shaft drive pumps. 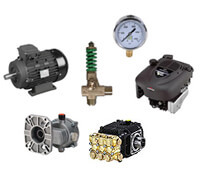 These pumps are used for electric motor or gasoline powered applications and designed for belt drive, coupling or gearbox systems. In moderate pressure washing equipment, many of the same components work for a wide variety of power washer functions. The same ceramic plungers and die cast bodies work in the moderate models as in their high pressure counterparts. Specially designed valve cages, constructed of Ultra Form are used to extend the life of the machine. In addition, they are impervious to the absorption of water. Without the right pressure washing equipment – and equipment that works properly -- you can’t offer the same type of quality service as your competitors. Once way to stay a step ahead in the power washing industry is to get to know your equipment, so that you can spot problems right away, thus alleviating poor workmanship due to faulty or worn pressure washing equipment and parts.